Computer Graphics Forum, 34(6): 262-276, 2015. The dance motion capture data used can be downloaded from the Dance Motion Capture Database website. In Proceedings of the 9th International Conference on Computer Graphics Theory and Applications (GRAPP'14), pages 277-287, Portugal, January 05-08, 2014. In SIGGRAPH Asia Technical Briefs (SA'13), ACM, New York, USA, 21:1-21:4, 2013. In Proceedings of ACM Motion in Games (MIG'13), Ireland, November 7-9, 2013. The increasing availability of large motion databases, in addition to advancements in motion synthesis, has made motion indexing and classification essential for better motion composition. However, in order to achieve good connectivity in motion graphs, it is important to understand human behaviour; human movement though is complex and difficult to completely describe. In this paper, we investigate the similarities between various emotional states with regards to the arousal and valence of the Russell's circumplex model. We use a variety of features that encode, in addition to the raw geometry, stylistic characteristics of motion based on Laban Movement Analysis (LMA). Motion capture data from acted dance performances were used for training and classification purposes. 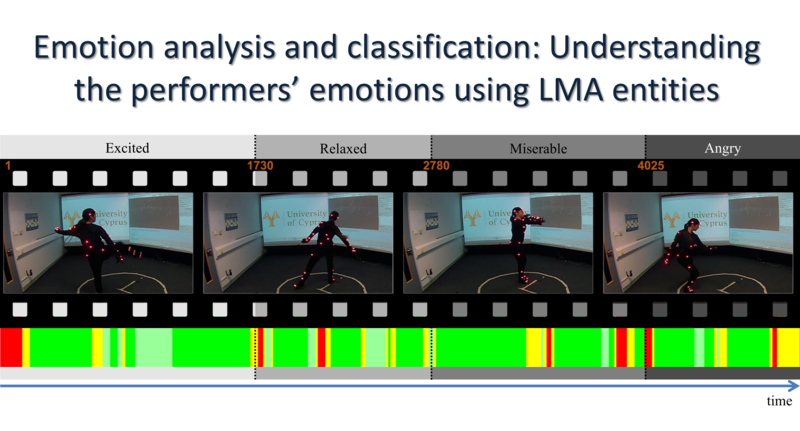 The experimental results show that the proposed features can partially extract the LMA components, providing a representative space for indexing and classification of dance movements with regards to the emotion. This work contributes to the understanding of human behaviour and actions, providing insights on how people express emotional states using their body, while the proposed features can be used as complement to the standard motion similarity, synthesis and classification methods. This work is co-financed by the European Regional Development Fund and the Republic of Cyprus through the Research Promotion Foundation under contract ΔΙΔΑΚΤΩΡ/0311/73.